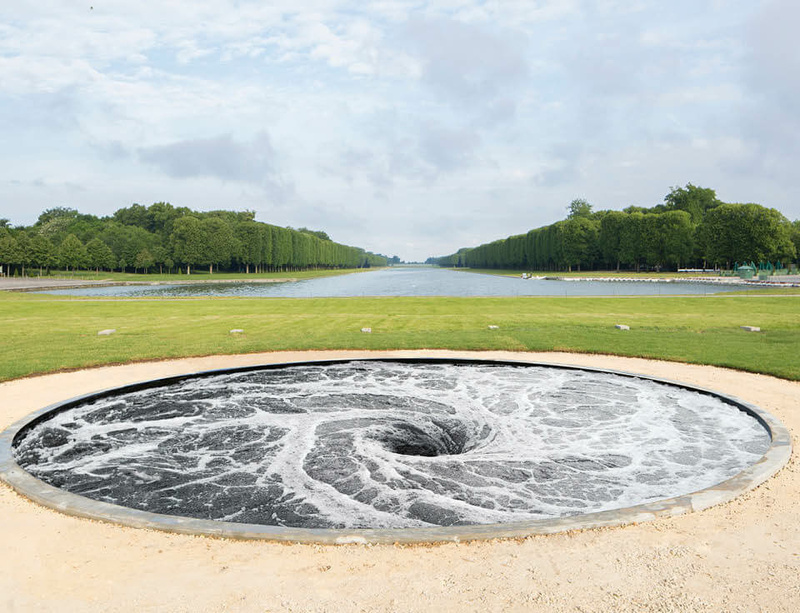 Anish Kapoor is the latest contemporary artist to be invited to exhibit in the grounds of the Palace of Versailles, throughout the summer of 2015. While Lee Ufan in 2014 entered into dialogue with the famous architect of the gardens, André Le Nôtre, Kapoor brings a more political perspective on power and its depiction to Versailles, as the palace celebrates the tercentenary of Louis XIV’s death. Kapoor’s works intervene in the precise and manicured gardens designed by Le Nôtre, excavating red gashes and piles of rocks and leading visitors to a giant whirlpool (Descension, 2015), a violently swirling and yet perfectly geometrical vortex. He has further disrupted the sloping vistas of Versailles with a colossal flaring tunnel, entitled Dirty Corner (2011-15), made from Corten steel. Among the other works on the terraces are the reflective C-Curve (2007) that turns the world upside down and a raised, tilted Sky Mirror (2013), bringing the sun itself down into the landscape of Versailles.